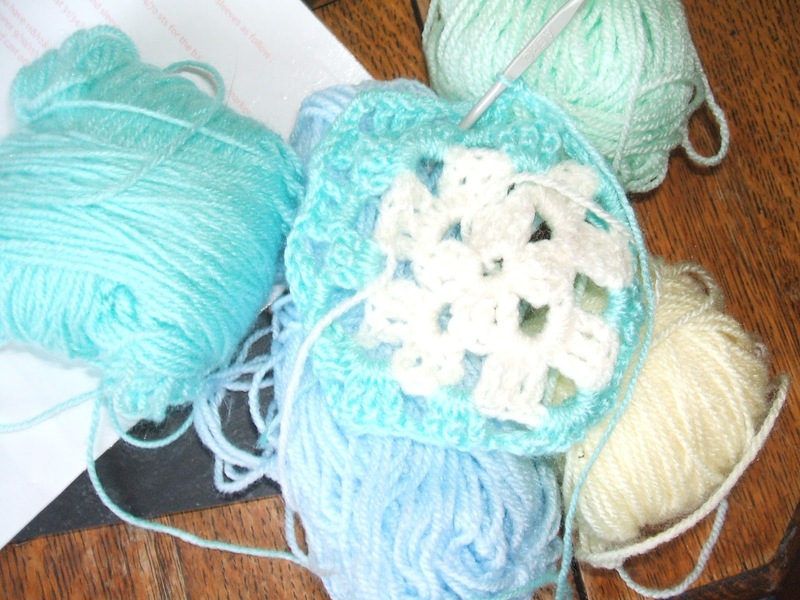 Hi - after the recent cushions I was feeling all crocheted-out, so I flutterbied across to knitting. I'd wanted to try out circular needles, and they've won me over. 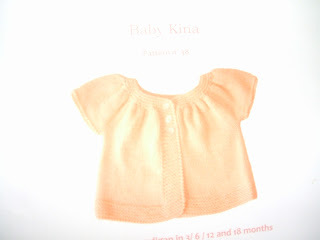 I started this kina (inspired by retromummy -http://retromummy.blogspot.co.uk/ ) who seems to knock them out by the dozen! I really enjoyed knitting something all in one (no seams except for the teeniest bit under the arms). I finished it this afternoon, and just need to buy three pretty buttons. I made the mistake of taking it to DD1s last night (only joking, Jen!) and said she could have it for a friend's baby that had arrived the day before. I now need to do another or find something else for the person I was going to give it to. Oh well, I suppose that's what being a mum is all about. On second thoughts, I should have told made encouraged her to have a go herself! This is the pattern - it's on Ravelry and cost £2 or £3. This was the smallest (3 months) but it came out a bit big to my mind. The pattern goes up to 18 months but you could easily increase it to almost any size. I loved knitting on the one needle - especially when there were 190 stitches - I'd have struggled to get them on a normal straight one. I liked that I could push the work onto the plastic cord, off the metal needle part, when not in use - virtually impossible to drop stitches. However, the cord made counting more difficult than normal, as the stitches were very loose but since I only had to do it once, it wasn't too much of a hardship. Knitting that got me over the all crocheted-out feeling I'd had, which was just as well as I heard today of a baby shower for Esther - this Sunday! So, it was out with the hook again, all systems go with the never-ending cream wool (three granny cushions and the kina so far from a 400g ball!) 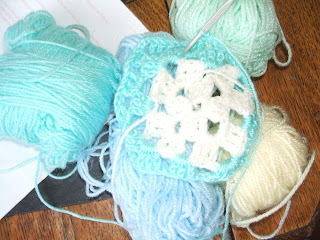 to link up a selection of pastel yarns from my stash, for a baby blanket. With all this activity, I forgot to plant the baby cos lettuces I was given on Saturday! 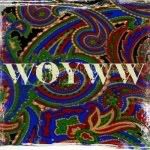 They're currently reviving (I hope!) in a bowl. They came from an amazing neighbour of mine. Jim is 93 this year, apparently the sole survivor of the Battle of the River Plate. He looks after his front garden and his next door neighbour's and they look like a public park. His back garden is given over completely to vegetables and he has won our city in bloom garden award more than once. On top of all that, he has only just given in to using his bus pass to get to town (3 miles!) but still walks to the Co-op, a good 20-minute walk away. He is one of the old-style thrifters ("You won't throw away the containers, will you?!") They are plastic cups that have been recycled at least twice already - fantastic! I was given this plant last year (stocks?) 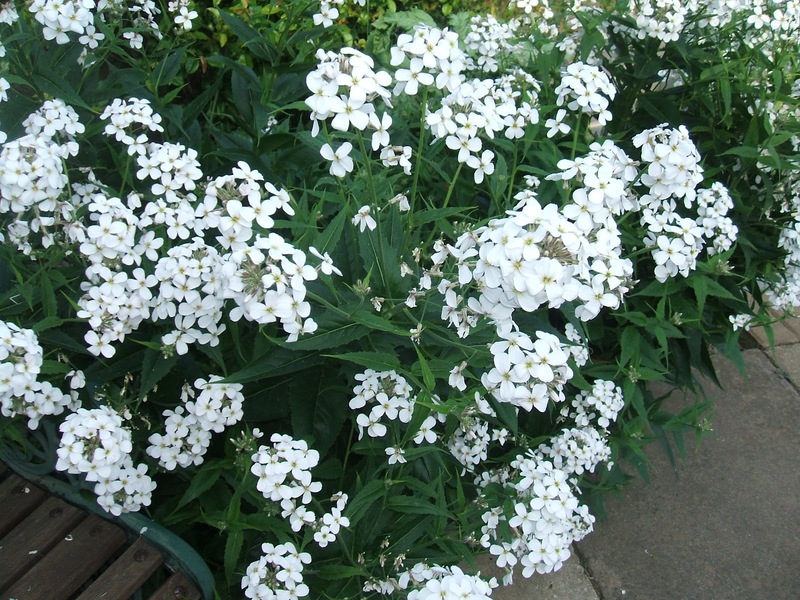 Anyway, the scent is gorgeous, just outside the patio doors. 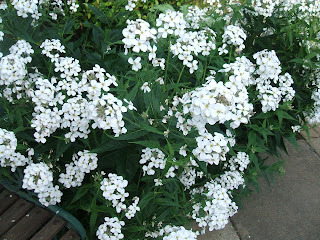 I must look up if I can propagate them, or whether they are perennials - sorry, rambling here! 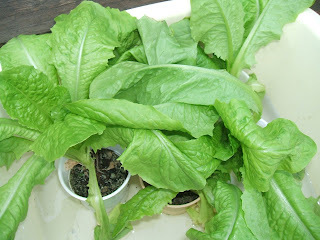 Anyway, I'd better get the dinner ready, so I can get out and plant those lettuce and check the greenhouse this evening. Love the little cardi, and Jim sounds just like my grandfather was - recycling before the word was invented and no space in the back garden for anything that wasn't edible! Love that little cardi - no wonder it was snapped up! Jim sounds amazing - just goes to show the power of staying active. 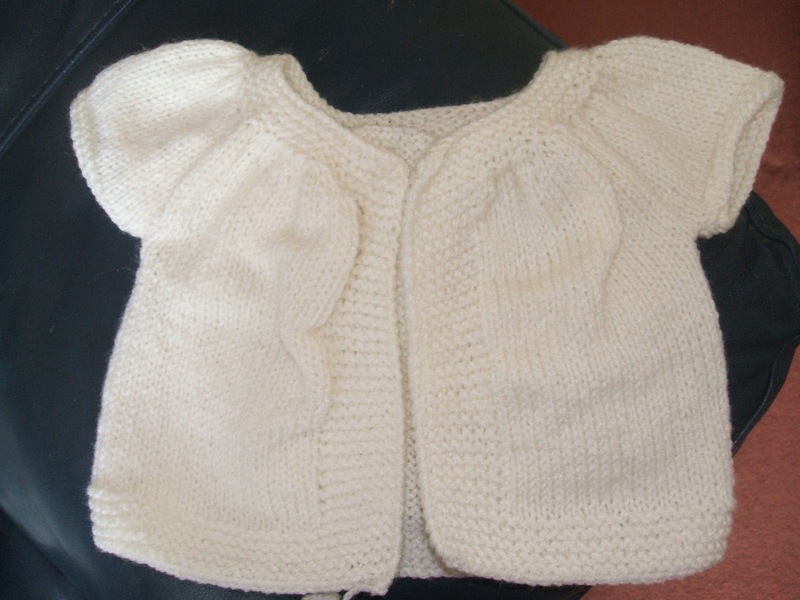 Gorgeous cardi! I want to be like Jim when I get old too, sounds like the way to live. Love the story of your 93yr old neighbour. Just asked hubby for a history lesson on the Battle of the River Plate. Guess your neighbour can tell a good story about that. Hugs Mrs A.